Made-In-Nigeria potential high: Chinese ambassador – Royal Times of Nigeria. The Ambassador of China to Nigeria, Dr Zhou Pingjian has said that the potential of “Made-in-Nigeria” products with China is huge. Zhou, who said this on Thursday in Abuja at a dinner to mark the China National Day said that China was committed to ensuring the realisation of products that are made in Nigeria. 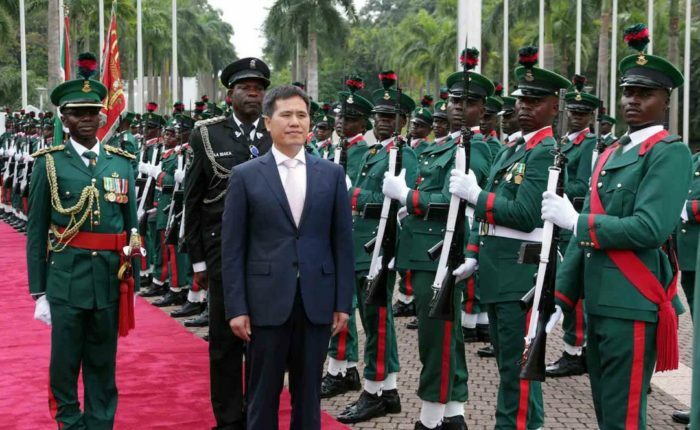 The envoy said that this was part of China’s determination to share its experiences, provide capital, technology and talents in support of Nigeria’s industrialisation. He said that China valued its relations with Nigeria and that the two countries should seize the opportunity and work together for the benefit of both countries. “China provides bigger market, more capital, greater variety of products and more cooperation opportunities for countries around the world, including Nigeria. “The potential of “Made-in-Nigeria” with China is huge. “China and Nigeria, both large developing countries, regard each other as important strategic partners. Since the establishment of diplomatic ties 46 years ago, much progress has been made in our bilateral ties. “The all-dimensional, wide-ranging and high-quality cooperation between our two countries has been a pacesetter in China-Africa cooperation, bringing real benefits to our two peoples and contributing to world peace and development,” he said. According to him, China has become Nigeria’s largest project contractor, second largest trading partner and a major source of investment. He said that with strengthened mutual trust and economic complementarity, the bilateral relations of the two countries faced new strategic opportunities of growth. “Industrialization is one of the five execution priorities of the Economic Recovery and Growth Plan, which was released by Nigerian Government in March. “As the world’s top manufacturer, China has proved to be a most desirable and reliable long-term partner for Nigeria in its quest for development and prosperity. “China supports the relocation of its industries to Nigeria and expansion of production capacity cooperation with Nigeria on a priority basis,” he said. Zhou said that China’s development was open and cooperative, adding that in the next five years, China would import goods worth 8 trillion dollars and attract foreign investment of 600 billion dollars. He said that the country would then have made outbound investment of 750 billion dollars and it’s outbound tour visits would exceed 700 million dollars. According to him, all these would provide bigger market, more capital, greater variety of products and more cooperation opportunities for countries around the world. The envoy said that China and Africa were a community of shared future with common interests and challenges as well as a community of common interests with win-win cooperation. He said China-Africa cooperation was undergoing three positive shifts; from government-driven to market-driven, from trade in goods to cooperation on production capacity and from project-contracting to capital investment and operations.